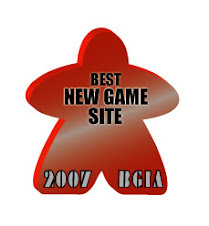 Roughly once a year I force rank the games published in a particular year that I have played, which I find to be an interesting exercise. For games published in 2011, I made such a ranking in early 2013. Let's see whether I have changed my mind about these games, and also how many additional 2011 games I have played since then. The content below is mostly from my earlier blog post. Additional comments are underlined. Sekigahara: The Unification of Japan - A tense card-driven block game, with simple and mostly text-free cards. It has bluffing, planning, and hand management. No dice. Whether you win or lose a battle is dependent on what cards you and your opponent are holding. However deciding whether to battle, which battle to fight first, whether to withdraw, when to play which card, which unit to commit to battle, all will determine the outcome of the battle. I have now bought my own copy - the second edition. A Few Acres of Snow - Deck-building not for the sake for deck-building. This is the deck-building mechanism supporting a game of conflict and development, and in this game it is a very appropriate mechanism. It's deck-building with a purpose, a context. But enough about deck-building. 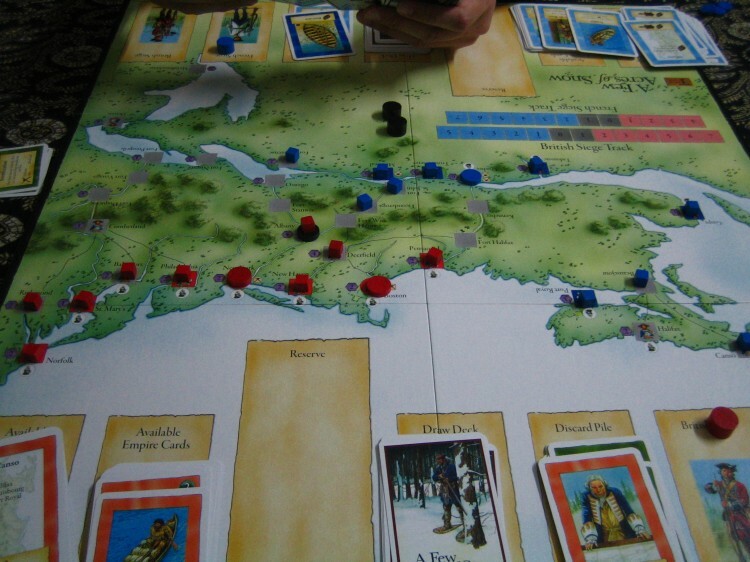 This is a game about the French-Indian War and how unwieldy it is for the British and the French to conduct warfare and develop their colonies. The two sides play very differently. The game is very thematic. 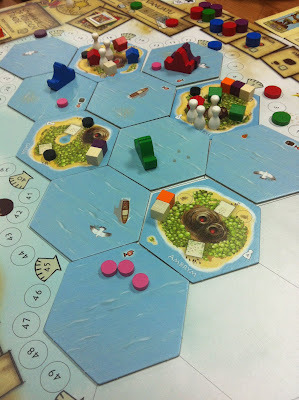 Vanuatu - The unforgiving action selection mechanism is the only new (I think) mechanism and it is the single most talked about aspect of the game. However I also find the game to be well put together, to have good mechanism-theme coherence, and to offer plenty of player interaction. The whole package is a fine design. It is not just one nifty mechanism. Promoted from "Happy to Play" to "Keen to Play", because I remember it fondly and I miss it. I haven't played it for quite a while. Mage Knight: The Board Game - Fantasy themed game, but you don't roll dice all the time to determine the success or failure of your actions. The game allows you to plan ahead a lot. You decide how to best use you hand of cards, and many card abilities are deterministic. You can calculate the results. I'm not a particular fan of the fantasy setting (but I don't mind it). I like the game because of how strategic it is and how you grow your character to achieve more and more. Mondo - Real-time puzzle-like game, not unlike Galaxy Trucker, but more suitable as a family game. Elevated a little. Ninjato - From reading the rulebook it seemed like another worker-placement, multiple-ways-to-score-points Eurogame. But I liked it better than I expected. I think I like the risk taking. 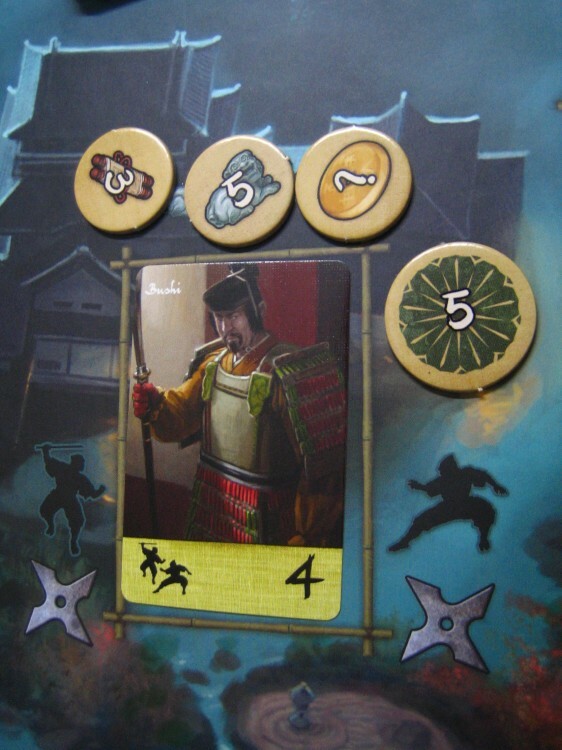 You train up your ninja and gather what you need to steal or to rob treasures. You need to balance between how much preparation to do and how much risk you are willing to take. Every mission is an adventure. It's nail-biting to find out whether a treasure is more heavily guarded than expected. It is tense when deciding whether to risk going for the next treasure in the house. Dungeon Petz - Buying pet monsters, taking care of them, and timing to sell them to the right customers to gain the most prestige for your pet shop. So many things to juggle, so many things to do. You need to guess how desperate others are in competing for the various pets, pet food, equipment etc in order to decide how you want to allocate your imps to compete. Dropped from "Keen to Play" to "Happy to Play", mostly because I have had the opportunity to play this once in a while, so I don't miss it as much as other games that I have not played as much. Friday - Solo deck-building game which is quite challenging. Needs a few plays to get the hang of it. Definitely worth the effort spent. Difficulty level can be increased as required. Quite fun to explore the strategies. Dropped from "Happy to Play" to "Lukewarm", because I feel I have seen all there is to see. I've played quite many games so I definitely have got my money's worth. It is still challenging and interesting, just that I have no urgency to play it again at the moment. Omen: A Reign of War - Not sure how this got here. My plays of this 2-player conflict card game were quite positive. Plenty of opportunities for clever use of card powers. I never had a bad session, but somehow I'm not so keen to play this again. Maybe I've just forgotten how much fun it is and need a refresher. 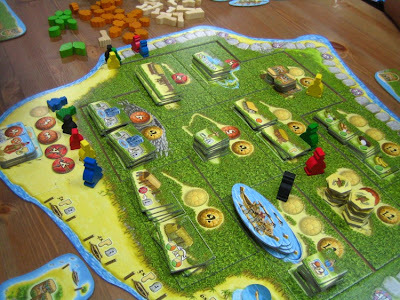 Kingdom Builder - Chong Sean said this plays much better than it sounds from reading the rules. Maybe I will try this when I get the chance.New. Plays better than it sounds from reading the rules. There is variety and the strategy is more interesting than I expected. Takenoko - Pleasant gameplay, beautiful components, but nothing really pulls me back. Mundus Novus - Card game. Fun with set collection. Some special abilities thrown in. Not bad, best with a bigger group. The Road to Canterbury - Allen has a copy. It's in our unplayed list. I haven't even read the rules yet. New. Finally played it. Better than expected. Some brinkmanship. Some dark humour. Eclipse - Sorry, please don't take away my gamer badge. I would definitely like to try it if I get a chance, but I'm not eager enough to seek it out proactively. It's a multiplayer development and conflict game, executed beautifully. The "multiplayer conflict game" part doesn't particularly entice me because there are many such games around. I guess "smooth and streamlined execution" is not big enough a lure. New. I have played this now, but only the iPad version. Unfortunately the only games that I managed to complete were against AI's. The games played against Han and Allen took too long and they crashed. They disappeared, and we could not continue. I suspect a bug. The iPad version didn't thrill me much. I didn't read the rules. I only did the tutorial. If I get a chance to play the physical copy, maybe I will learn the rules properly and try to see whether playing the physical copy face-to-face is better. The Castles of Burgundy - Stefan Feld's games usually don't click with me, but this one may work. New. Not bad. Has the Feld trademark. It has the multiple-paths-to-victory thing that bores me a little, but there is also a spatial element and some risk management that I enjoyed. Ora et Labora - A building-powers and cube-production / cube-conversion engine-building game, the end goal being to score the most points. 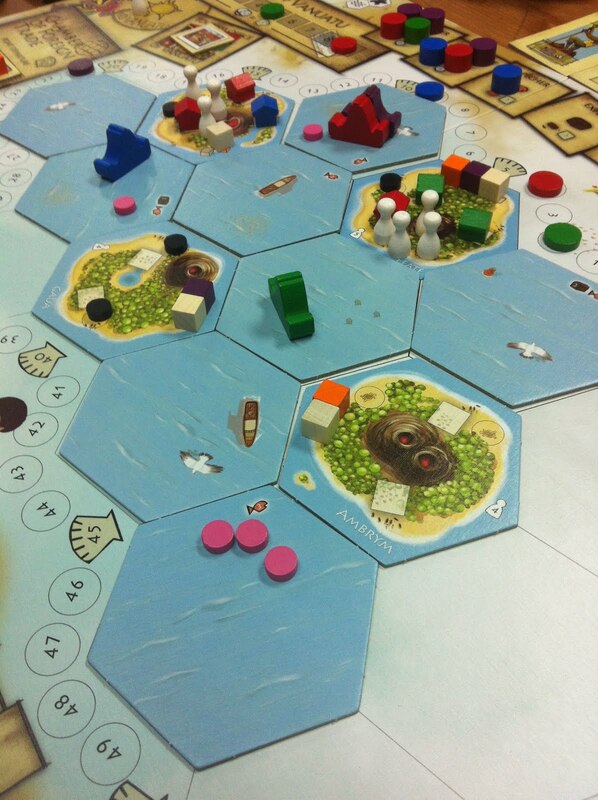 It has the Le Havre feel - many different industries to pick from and thus many different ways to score points. I have only played a handful of games and have not really explored it enough. Dropped from "Happy to Play" to "Lukewarm". It has differences from Le Havre, but I don't feel it is better than Le Havre. Maybe I just need to spend more time to discover its nuances and beauty. JAB: Realtime Boxing - Frantic real-time 2P game that requires quick pattern recognition and deliberate manoeuvring. Not as fast and furious as I had expected. You need to think a lot and think fast. Went up a little, probably because it's something unusual. Nightfall - I'm starting to find the colour matching for card chaining tedious. A game with 3P or more sometimes boils down to keeping a low profile and letting others fight one another. 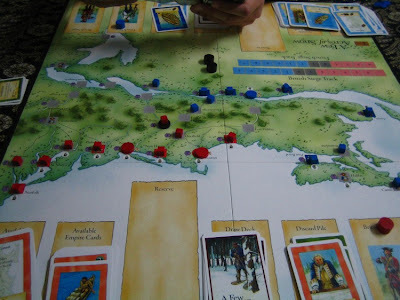 Power Grid: The First Sparks - Streamlined version of Power Grid with a different theme. Nice, but it didn't feel very necessary. 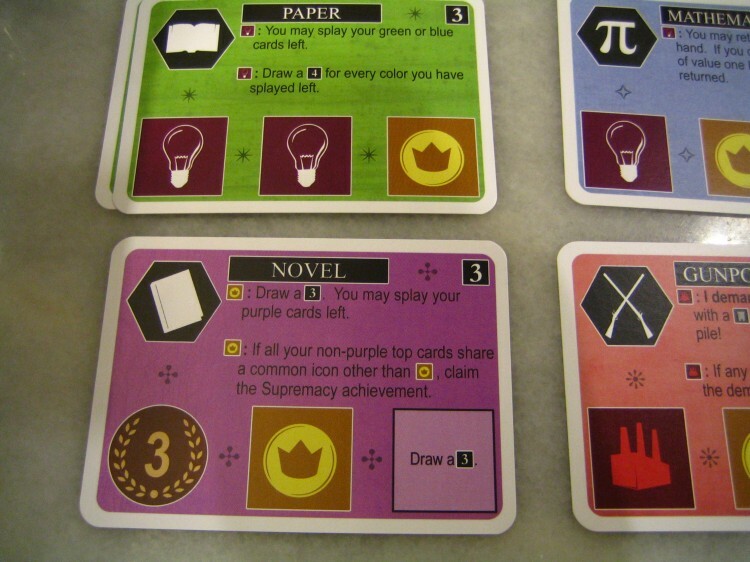 Probably more suitable for people who don't like the maths in Power Grid. I don't mind the maths in Power Grid. Position dropped. Risk Legacy - The idea of permanently damaging, customising and evolving your copy the game is interesting and fun, but it's still just playing Risk. I'd play it with my buddies, but it's not something I seek out. Dropped from "Lukewarm" to "Rather Not Play". Upon this revisiting of this list, many games have dropped to this category, because at this moment there are a few other games (some not published in 2011) that I'm keen to play, so my enthusiasm for these previously "Neutral" games diminished significantly. Airline Europe - Area majority is a big part of it. Dropped from "Lukewarm" to "Rather Not Play". Lancaster New. It's a fine game, but there is nothing in particular that draws me back. Cave Evil - Squad-based combat game. Now that I think about it, it has some similarities to Summoner Wars. Dropped from "Lukewarm" to "Rather Not Play". Urban Sprawl - Area majority games usually don't click with me. Dropped from "Lukewarm" to "Rather Not Play". 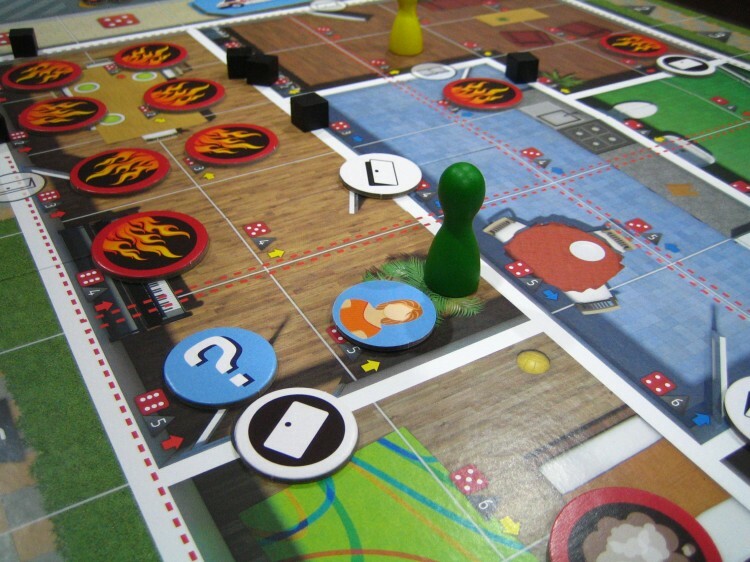 Flash Point: Fire Rescue - A cooperative game. A theme that people can easily relate to, but gameplay doesn't have a hook for me. It's "another OK game" to me. Dropped from "Lukewarm" to "Rather Not Play". The Ares Project - The basic turn structure is simple, but I find that the game is bogged down by the many special abilities. The factions are certainly very different and unique. I wish the game were a bit more streamlined. If I can get more plays in and get to know the factions better I will probably like this better. So maybe I'm the problem, not the game. Dropped from "Lukewarm" to "Rather Not Play". Yomi - Card game about 1 vs 1 fighting, using a rock-paper-scissors mechanism. It's much more than just rock-paper-scissors, but this core mechanism makes me a little uncomfortable. Dropped from "Lukewarm" to "Rather Not Play". Undermining - Nothing wrong, but not very memorable either. Dropped from "Lukewarm" to "Rather Not Play". Hawaii - I recognise the solid mechanisms and the game balance, but to me it encapsulates the soulless, mechanical Euro. I don't want to play solid mechanisms. I want to play a game. The bottom three are still at the bottom, because I never gave them another chance to change my opinion. 1955: The War of Espionage - This tug-of-war can become a boring stalemate, especially in the late game. Carnival - Roll dice and use their powers to collect sets of cards. Simple; short-term tactical. These are not ranked. Just some quick thoughts. 7 Wonders: Leaders - A decent expansion, but I have not played much of it because I have not been playing 7 Wonders much. So I have not invested further in other expansions. This expansion is not getting used much at all because I rarely play 7 Wonders nowadays. Ascension: Return of the Fallen - Bought on iOS. Good to have more variety in the cards, now that I am playing Ascension so regularly. Some new concepts added, and they are simple and fun. Ascension: Storm of Souls - Ditto. 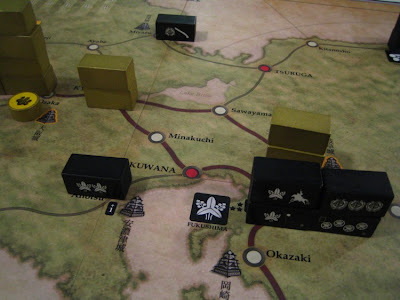 Ticket to Ride: Asia - Have not yet played the Team Asia map, which I suspect will be the more interesting map. The Legendary Asia map is OK. More variety. Small twists added. I've tried the team game now. It's quite different and more interesting than the Legendary Asia map. If you want to buy this expansion, buy it for this team variant. Innovation: Echoes of the Past - Some new concepts added. Play this only after you're familiar with the base game, so as not to overwhelm yourself. It's nice to have increased breadth, but not absolutely necessary. I am thinking of getting this, but I have not been playing Innovation much lately. Power Grid: The Robots - Makes the 2P (and maybe 3P) games more interesting. It's a useful tool if you are often short on players. Otherwise not necessary. Nightfall: Martial Law - I'd say it's more of the same, i.e. good if you like the base game. Only a few small additions to rules. Evolution: Time to Fly - More animal abilities, generally a little more complex. You only need this expansion if you have already played a lot of the base game and feel like adding some variety. Some of the better known games published in 2011 that I have not played. Space Empires 4X - Han's copy is on my shelf. Maybe we'll get to play it soon, when he is back from his long overseas work assignment. Discworld: Ankh-Morpork - Allen has a copy, but our unplayed list is long. I've recently started reading some Discworld novels, and they are fun. Battleship Galaxies - It sounded fun, but the buzz seemed to have quickly evaporated after the game release. Dominion: Cornucopia - My many plays of the computer version of Dominion in 2011 made me appreciate the game. However after that burst of plays against the AI's, I abruptly stopped, and didn't pursue further playing against humans. So I have no tried this expansion or the next one. Belfort - "Worker placement" is a dirty word to me now, despite the fact that there are some worker placement games that I like. Star Trek: Expeditions - Knizia cooperative game. Last Will - I followed this game for quite some time, but after a while, it didn't seem all that unique other than the background story of trying to deplete your small fortune as quickly as possible. Colonial: Europe's Empires Overseas - Beautiful game, but the buzz seemed to die out quite quickly. What happened to this game? Glenn Drover's Empires: The Age of Discovery - Builder Expansion - I should play the base game more. I quite like it. Strasbourg - Jeff recommends this. The New Era - An improved version of 51st State. I enjoy the older game well enough, but have not been playing it intensively enough to feel like getting the improved version. Bios: Megafauna - If I had more time and fewer other games to play, I might invest in one of these Sierra Madre games which are very well researched and thematic. Coney Island - Because of how much I like China, I read up a little on this newer game by Michael Schacht. Didn't seem to be a lot to it, but then I think his games need to be played to get the real feel. The simplicity in the rules can be misleading.